Buy Natural by Nature geranium essential oil - 10ml in the UK from our online shop or directly from our independent Scottish store. Geranium (Pelargonium graveolens) essential oil from the leaves. Natural by Nature's geranium (Pelargonium graveolens) essential oil is from the leaves. A soothing and balancing oil, useful for both mind and body. It has a sweet, lingering and powerful aroma and it is best used in small quantities. As official Natural by Nature stockist, we sell genuine Essential Oils directly from our shop in Scotland and online throughout the UK. Natural by Nature are a family-run business, established in 1974, and are recognised as one of the leading authorities in the aromatherapy field. View more products from Natural by Nature. Where can you buy real Geranium Essential Oil 10ml safely online? If you are wondering where you can buy Natural by Nature geranium essential oil - 10ml safely online in the UK, then shop with us. We are an actual health foods shop; with real people selling real foods and products. Our award-winning independent shop is located in Stirling, Scotland since 1976. You can buy our Essential oils and base oils and blends and other genuine Essential Oils in store or safely place an order with us online or over the phone. 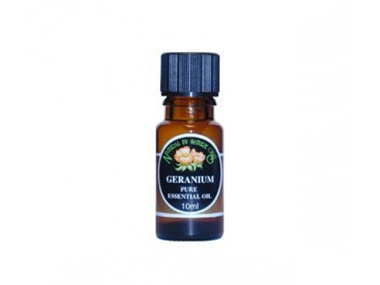 Geranium Essential Oil 10ml - Natural by Nature geranium essential oil - 10ml in Essential Oils and Aromatherapy.